In the recent issue of American School & University magazine, Jill Nolin wrote about the design of creative spaces in schools. Schools with varying levels of resources are adopting the concept – a Maker’s Space is, after all, about creation and innovation – but a few big-ticket items, like 3D printers, production equipment and laser cutters, have become popular additions where feasible. That has, in turn, led some schools to designate specific areas as a Maker’s Space that can be easily secured and monitored. But two experts say to be wary of relegating the concept to one space in the building. 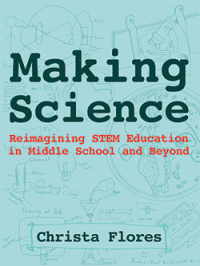 Sylvia Martinez and Dr. Gary Stager, co-authors of Invent to Learn: Making, Tinkering, and Engineering in the Classroom, say what they are seeing with Maker’s Spaces now is reminiscent of the early move toward computer labs.